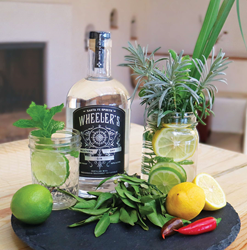 Sunrise Springs Spa Resort announces a series of mixology classes with Santa Fe Spirits Mixologist James Reis, where guests will create their own garden-to-glass infused with garden herbs grown on site. Launching on March 25, International Happiness Day, the Happy Spirits Mixology Experience will take place in the Sunrise Springs’ Willows Horticulture Kitchen from 3:30 pm to 5:30 pm. The cost is $35 per person and $50 per couple. Libations include lemon verbena and rosemary vodka, plus delectable appetizers including. Guests are invited to make a reservation to stay for dinner afterward. The class is currently limited to 12 people.